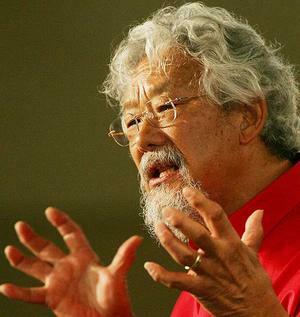 Last night I had the honour to listen to David Suzuki, one of Canada’s national heros, in Castlegar, B.C., Canada as part of the Mir Center for Peace Lecture Series. He is an inspiring and passionate speaker on the environment. It is clear why we have all been glued to his TV shows, such as CBC’s The Nature of Things, since the 1970’s. Dr. Suzuki reflected on being an elder (i.e. 74 yrs old), and that the questions haven’t changed much over the years. These questions include: Who are we? How did we get here? and What’s it all about? The lecture summarized some key points on the need to recognize the basics of life, biodiversity and role of the human brain in getting us to where we are today. He wholeheartedly emphasized the need to put the eco (house) back into economics and start valuing the very elements in this world we need to survive. He challenged us to see the world as it really is, to slow down, and reimagine the future. While I respect this man and all he has done to communicate environmental issues to the public, I found his talk lacking on some key points, namely that of equity. Firstly, the lecture focused on the footprint that 6.8 billion people have on the world. This aggregate number misses the point that most of the population is living in poverty and that the impact is our responsibility as North American/Western consumers. Secondly, he spoke of the need to limit growth. Again, there are many countries in this world that need growth while others need to question their growth, both quantitatively and qualitatively. The rights of less developed countries to develop should be recognized. Thirdly, Dr. Suzuki challenged us to see the world as it really is, i.e. a tree can be lumber or a tree can be the lungs of the earth. He was referring to the latter. My question is who decides the definition? In a globalized world, we need to respect the rights of local people and hence poor people often see resources differently than we do (i.e. that tree is shelter, energy, medicine and food). Sustainable use is a more equitable option than preservation in many cases. Suzuki focused on his world view, a deep green view in which we are all animals. My take on the situation is slightly more pragmatic. It’s not a one-sized fits all for the planet. Biodiversity is key, including human diversity. This means there will be trade offs and everyone will have to give a little, some will need to give more and take less. We are fortunate here in Western Canada. We need to expand our world view beyond the geography in our backyard and support efforts for others in the world to gain access to their land, resources and rights to an income. Recognizing the needs of poor people and the planet will hopefully lead to a healthier planet for all. With a captive audience at the Mir Center, Suzuki missed an opportunity to provide the fuller picture of our global dilemma. A colleague forwarded me an interesting study about how to communicate conservation to the public. It was not news to hear that messaging is important. However, it was interesting to read which messages worked and which did not as well as reflect on which ones I am using or have seen used in work related to promoting conservation in Canada and abroad. Clean energy jobs/jobs protecting water quality/etc. Despite some jargon entering mainstream dialogue, the idea that most people don’t get the jargon has been reinforced. The charts above provide a summary of the key take-home messages that I will use when thinking of engaging people on this topic in the future.